This first glimpse raises questions about the dark matter models we use. 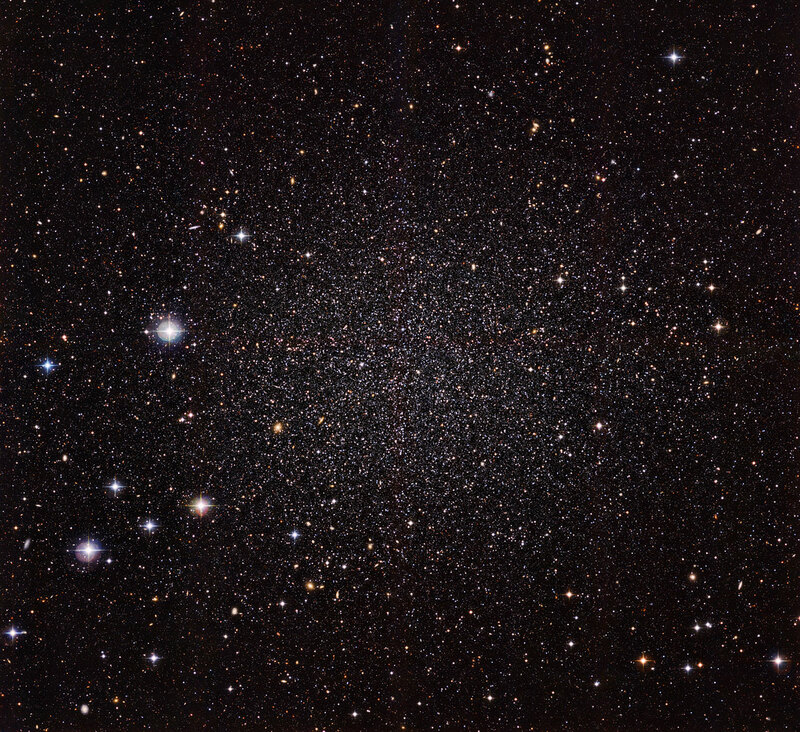 The Sculptor dwarf galaxy is a satellite of the Milky Way, appearing here as a faint “cloud” of stars. ESO. When you look up at the night sky, the stars appear fixed — but things are not as they appear. In fact, every star in our galaxy is moving. While it’s easy for astronomers to measure whether a star is moving toward or away from us, it’s much harder to measure a star’s motion in the plane of the sky, or side to side. This is because the stars are so very distant, it takes years for even the most minute change to become visible. It’s why the constellations have appeared essentially the same over time; but given enough time, they will eventually warp and change as the motion of the stars that make them up becomes apparent. This “sideways” motion, called proper motion, has only ever been measured for stars in the Milky Way — until now. Recently, a group of astronomers combined data from the Hubble Space Telescope and the European Gaia mission to measure the proper motions of several stars in the Sculptor dwarf galaxy, a small, nearby satellite of the Milky Way. Their work, published yesterday in Nature Astronomy, now presents a possible challenge to the standard models of dark matter haloes believed to surround galaxies such as our own. The Gaia mission measures the positions of stars very precisely. While most of these stars are in our Milky Way, its targets do include some stars in nearby galaxies, such as the Sculptor dwarf. The Hubble Space Telescope has also observed some of these same stars, measuring their positions 12 years ago. Davide Massari of the University of Groningen and colleagues at the Kapteyn Astronomical Institute were able to combine the Gaia and Hubble data — no easy feat, as the two measure position differently — to find that 15 stars could be accurately tracked between the two epochs. “We determined how the stars move in this small galaxy,” Massari explained in a press release. “But our measured value was very surprising, as the standard models didn’t allow it.” Those standard models describe the expected distribution of dark matter in a huge halo around the Milky Way, inside which the Sculptor dwarf is embedded. That dark matter should dictate how the stars move; disagreement could mean the models are wrong and need updating. However, there is another explanation for the stars’ seemingly strange motions. “The models assume all stars to be in a single population of stars,” Massari said. But the Sculptor galaxy has at least two known populations of stars, one more compact and one more extended. The stars in each population experience different impacts from dark matter. If the stars measured in the study all belong to the compact population, it would explain why their motions disagree with the dark matter models, preserving those models with no need for alteration. As more Gaia measurements come in, they will continue to help astronomers chart the motions of stars in our galaxy and many others. This information will help us form a better picture of the galaxy we live in and the behavior of those around us, including the influence of the dark matter we can’t see.